Originally, I started writing to uncover what lay buried in the mud within me. As a child, there were things I could write about that I wouldn’t dare say out loud, things needing to be brought out into the open so as not to fester deep inside me, developing into a volcano. My diary was my best friend for many years. I would write as I huddled in my cubbyhole in the attic eaves, a place designed for storage but used as a private space for me. Flashlight in hand, a book to read and a diary to write in—all comprised my comfort area. Perhaps, sometimes, I would be lucky enough to have an Army-green can of cinnamon swirled pound cake, rations left over from World War II that my father acquired years later. Reading, writing, eating—all the comforts for a shy young girl needing an outlet for her emotions and a safe haven. One day, in the eighth grade, the assignment was to write about a hobby we enjoyed and how we became involved in that hobby. I wrote all about being in my grandparents’ very old, rambling house, with the rickety staircase going up into the musty attic. On one rainy day I was continuing my exploration of the house. While rummaging in the attic, I discovered a collection of coins in an old, tea-colored and stained box, tucked away in a hidden nook. When I brought them downstairs and questioned my grandfather, I found out the assorted coins belonged to his grandfather. My grandfather added a few more when he found them as a boy, but then the collection was once again hidden away. We looked at the coin collection together and, as he told me about the individual coins, I became interested not only in the history revealed about the coins themselves but also about the history of my ancestors. So I continued collecting coins and relished the feeling of being part of a long line of people who engaged in this hobby. I finished writing just as the teacher called for the papers to be handed in. I felt good about what I had written. However, I couldn’t sleep at all that night. I tossed and turned so much I gave myself a headache. I agonized. How terrible! How could I have done that? Thoughts raced through my head and collided with each other, creating pain in my head. What is wrong with me? None of what I wrote was true. I made up the whole story about collecting coins, and I had no idea why I did. I didn’t remember reading something similar in any of the many books I read. How could I have written such a lie? Why did I? By the next morning I was a wreck and my stomach was in knots. I couldn’t eat breakfast and dreaded going to school yet I also couldn’t wait to get to school to admit to the English teacher it was all a lie. With many false starts and gulps, sweaty hands and a flushed face, I finally told her. None of what I had written was true. I was sure I would at least wind up with a detention and my parents would be told. Much to my surprise, my usually extremely strict and exacting English teacher said it was perfectly all right. She read the stories and found mine to be well-written so I received an ‘A.’ The fact I lied made no difference—it was the use of grammar and the way the story was told that was important. She said the story was a far more interesting way to start a hobby than the other students’ stories were. And she appreciated why I felt I had to tell her the truth. Since then, the many kernels of writing excitement have popped open to reveal a poem, a memoir, a story, a book. As I delve into memoir writing, I still agonize over trying to dig out the truth rather than use a fabrication. I read of getting to the emotional truth rather than necessarily the factual truth. Does it really matter if the curtains were white or yellow that day 50 years ago or is the important memory the feel and smell of the starched curtain (white or yellow) to remind you of your Grandmother’s living room? William Zinsser speaks of “inventing the truth,” of acknowledging we write of the truth as we know it, not necessarily as anyone else knows it. Bill Roorbach says, “The reader also comes expecting that the writer is operating in good faith, that is, doing her best to get the facts right.” And, of course, the recent controversy about James Frey’s work continues. Over the years, writing has become a connector, a healer, a transmission, a memory organizer, a revealer, a storyteller. Writing allows for patterns to be discovered, for healing threads to be woven into a wondrous tapestry with loose ends reconnected, for stories and ideas to be passed on to future generations, for the awareness of not only who, what, when and where but also why and how and what were the feelings and the lessons learned. Writing has revealed preciously hidden meanings and patterns in a tapestry much richer that I could ever imagine. I have written enough now to realize I am the pot of gold buried at the end of the rainbow, with each memoir or story or poem an antique gold coin, worth more in the present because it is based on an experience from the past. Added together, these gold pieces provide a treasure for my future as well as for those of my children, grandchildren and others. If I hadn’t dug up these memories and experiences, I would have lost them forever. They may be covered with the remains of dirt, and some may be a little discolored and faded, but the glint of gold still peeks through. After a little polishing and cleaning up, these antique gold coins will be worth a fortune. Come, m’lady. The child took a step, pulling on Thalia’s hand as the others started moving further within the catacombs. Thalia stood up, grasped the torch and followed, being led by the child who pulled ahead yet glanced back at her shyly. She sent out her thought to the child. What is your name? A mumbled something touched her awareness. The woman’s thought was clearer: Later. Just come. We’ve waited a long time. They walked in physical and mental silence, turning down one tunnel after another. After a while, as the darkness deepened, she couldn’t help but wonder how she would return to the entrance, but figured it would happen naturally. She thought of the stories she encouraged from hospice patients, volunteers and staff. Of how patient memoirs were so treasured by their loved ones after the patient died, sometimes even revealing stories the loved ones didn’t know about. She thought of how her own memoir process unearthed the web of patterns that helped clear misconceptions and resentments she had carried. Yes, we saw that in you, that which Is what we need done for us. The man’s thought broke through her own. Some of us have been waiting a long time to understand what happened in our lives and sometimes even in our dying. Thalia felt momentarily confused. But I record their stories before they die, not after. The woman stopped and turned around. But you told the stories of your ancestors after they were dead. And you’ve written poems and stories about when your loved ones appeared in a so-called “dream” and shared with you. What is so different? Nothing, I guess. I just never thought of this aspect until now that you mentioned it. And never thought a walking tour in the City of Ladies would lead to this deep part of the catacombs. I remember being intrigued by Orson Scott Card’s book Speaker for the Dead. What a great book. The woman resumed walking forward. Just come. You’ll see. After a few more twists and turns they entered a large cavern with many, mostly marble, sarcophagus’ and statues along the walls and throughout the room. Marble benches were scattered around. No one else was in the place. The trio escorted her to a bench in front of a large, ornate statue of a weeping angel. The child bobbed her head. She seemed small for her age. Thalia sat down on the bench and drew Maria close. What would you like to share with me? With tears running down her face, Maria’s thoughts gushed forth. It says my papa loved me but how could that be? When he did those things to me? The priest said it was wrong and papa was bad. He couldn’t have loved me. Her weeping escalated into sobbing, so holding her and waiting was appropriate. Finally the sobs subsided. Then the sickness came for mamma and me. They all said it was because papa was bad but he cried when we were sick on the bed. Then mamma died of fever and I got worse. Papa said he loved me but the priest said he was bad and didn’t love me. Was I bad? Is that why papa did bad things to me? Is that why I died? No, you were good. Your papa did things he shouldn’t have but you were good. It wasn’t your fault he did those things to you or that you and your mama died. Tell me more about your papa. Maria wiped her sleeve across her nose and continued. Mama said papa had been in a war, fighting far away. When he came home he was different. Then there was another baby coming and papa started touching me. Mama was busy with the baby and didn’t see. They argued about things that happened during the war, but I didn’t understand. There was a long pause. Are you sure I am good and not bad? Yes, I am sure. And even though your father did some bad things doesn’t make him all bad. His actions were bad but he could have also loved you. And sometimes war changes people and makes them act bad. After being away in a war you might have looked so clean and fresh that he just was glad to be home, and he wanted to be part of your innocence and freshness. What he did was very bad, but he could still love you. Maybe he was sorry about what he did. Look at the weeping angel—maybe he picked it out because it represents him weeping for what he had done. Can you understand that? Thalia thought of all the adults who could only see the world in black or white, and couldn’t understand shades of gray in people or allow for forgiveness. Their anger festered for years, or even for their whole lifetime, and made their lives bitter and the lives of the people around them miserable. They couldn’t separate the action from the person. If adults couldn’t understand, how could a child? I think so… maybe. I’ll try. I always thought the angel was weeping because I was so bad. No, that’s not why the angel is weeping. We grow when we can learn to forgive. It’s hard, but important. Forgiveness heals us and is more important for us than for the person we forgive, but both are important. Maria moved to gently touch the weeping angel and the engraving of her name and where it said she was the beloved daughter. As she sighed, she smiled. Thank you, m’lady. No, I am not a “m’lady.” I am just a woman on a walking tour of the City of Ladies. Now I am not sure where I am. A new-energy thought chimed in. We will call this place the Hall of Remembrances. Will you come back and help us tell our stories? There are many stories here needing to be told. She looked up to see many other pale figures emerging from the walls and statues, clustering around this latest thought-speaker. He appeared to be the one with authority. In his outstretched hand was a coin that seemed to have real substance. Remember us! The coin was suddenly in her hand, solid and heavy. A male head on one side and a woman standing on the other side. She looked at him, as he stood there with more physical essence than the others. 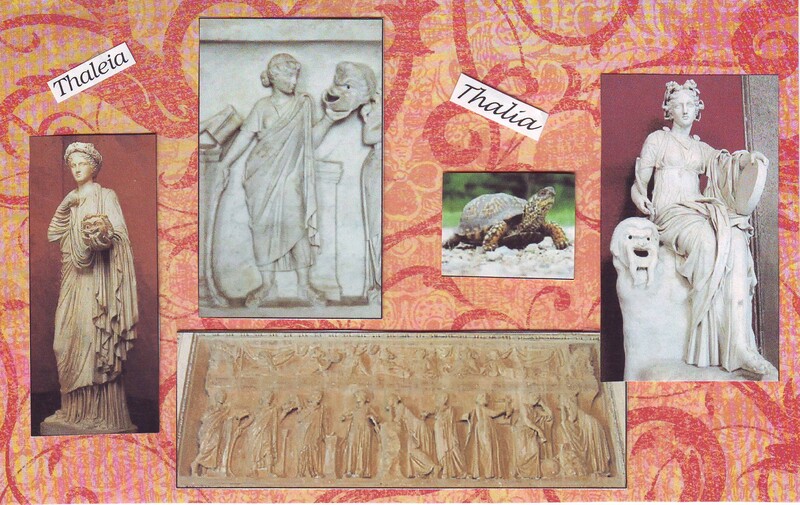 That’s Apollo on the one side; the muse Thaleia, as I know her, on the other. Take this coin and remember us. We await your return. Others like yourself are welcome, also. I will return now and again, and perhaps others will also come to help you. Thank you all for sharing with me and inviting me. For now I need to return and continue the tour. But I will be back to the Hall of Remembrances for more of your stories. And suddenly she was back at the entrance to the catacombs, coin in hand, ready for the next adventure, even as she wondered why Apollo and Thalia were on the same coin. Feeling cleansed of both physical and emotional “stuff” from Dame Washalot’s Bath House, she followed the walking tour map to the Catacombs. Most of her knowledge about catacombs was derived from movies of the 1950’s like The Robe, Quo Vadis, and Ben Hur which all portrayed early Christians hiding out and having services there. Later, she was surprised to learn catacombs were actually pre-Christian and even pre-Roman, and were used for burials and as hiding places from persecution. The Sumerians, Egyptians and Greeks all utilized catacombs. More recently she read Internet articles about supposed inner-Earth races living underground in catacombs, caverns and tunnels. And a Hope Indian legend speaks of a very ancient complex beneath the surface occupied by a lizard-race 5000 years ago. It didn’t help her to recall these interesting but potentially frightening ideas as she moved further into the catacombs. Even holding the torch she had been given at the entrance near the statue of Jesus at Gethsemane didn’t help—it just cast odd shadows. At first the walls were smooth so it wasn’t bad, but now there were cubby-holes and recesses with statues or sculptures within, to which the flickering light added a macabre element. As she approached each item, she thought they were moving. As she peered closer, she could then discern they were just statues of angels and people. Oh, what’s that? Looks like it’s moving. She crept closer. 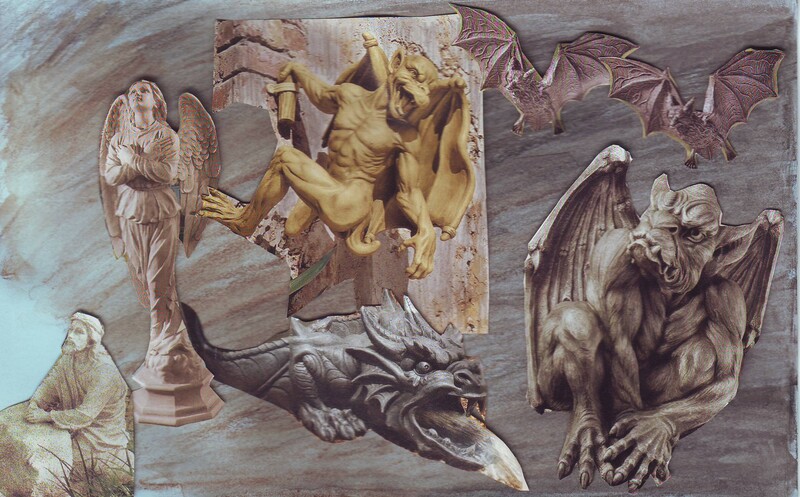 It’s a gargoyle, and here’s another. Why would they be in here? Maybe to protect the remains, as they usually are supposed to be ugly to scare anyone unwanted away. Something flew at her out of the dark; she ducked as another something flew past. Bats! Ugh! They must be roosting further within since I haven’t seen any guano so far. Now it was totally dark, except for the sputtering torch. She approached a marble bench in front of a sarcophagus within a recessed part of the wall. Tired, she placed the torch into a holder and sat down. I can’t walk all day the way I used to. Probably not too many years before my ashes will be placed somewhere. Would like for them to be scattered in various places but what if they were in a place like this? Maybe I’m passing or looking at my own burial from another time—the circle of time. She felt very much at peace here, surrounded by the remains of many people, deep within the earth—no noises of cars, power tools, construction, cell phones going off annoyingly or people having to talk all the time. Silence—stillness… She closed her eyes and meditated, sinking further into her center. First the pinprick of light in the darkness, then the starburst. She drifted out of her body, moved through the packed earth, into the air, above the city. She could see-sense for miles. With that thought she moved back into her body, but aware her physical body was now surrounded by other bodies. Keeping her eyes closed, she reached out her awareness to assess who was there. Feels fine. Good energy. She opened her eyes. A child was standing in front of her, looking at her. A woman on one side, an elderly man on the other. She nodded in respect to each translucent person—each smiled in return. She knew words were unnecessary. Hello. Who are you? How can I help? The woman’s thoughts were clear: Please, help us. We stay here now, close to what had been our bodies. But we need to have our stories told. The elderly man nodded as the little girl stroked her hand. He then thought: There are others, too, needing to find the meaning in the lives they lived. By telling their stories you will discover the underlying pattern and meaning, and reveal it to each of us. We can sense you’ve done it for others, could you do it for us? 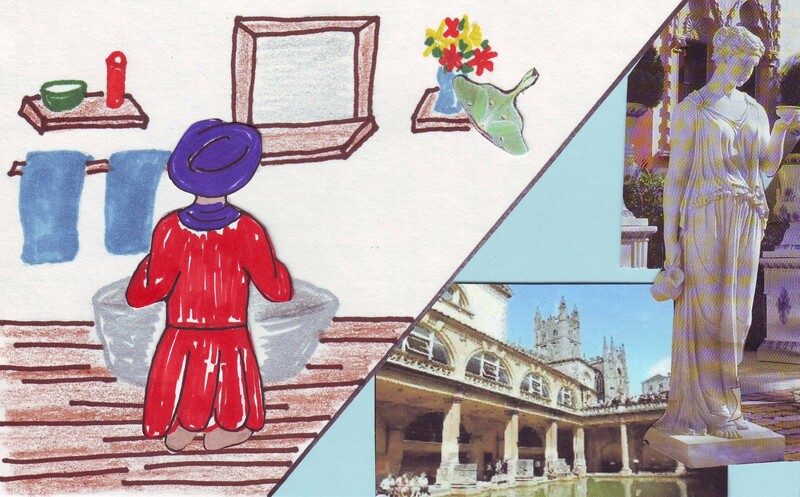 Wow, quite a difference from the Roman baths in Bath, England. Those were for soldiers and aristocrats mostly. Dame Washalot’s Bath House seems to cater to a full range of people and washes off more than just physical dirt and sweat. From the sounds of it, the Dame scrubs deep to wash off self-doubt, inhibitions and preconceived notions. What a delightful difference! She flew out the window and returned for her satchel before changing back into herself. Remembering her spa massage six years ago, about 8 months after her hysterectomy where the woman seemed to be trying to scrub out her scar and her surgery, she was ready for another massage, this one from the Dame. With head held high, she walked to Dame Washalot’s Bath House and entered. “Lemuria” Thank goodness she saw that sign posted on the tree before shape shifting into a young girl and blundering into the circus world. If she hadn’t, she might not have been so open to listening to the bearded lady when she relayed a story she once heard of a special city in Lemuria. At first, everything was going well with her circus adventure. Getting a job as a stand-in horseback rider, she was able to ride every day on different horses and ponies. And she got to know many new people, finding them to be quite a diverse group, as one would expect. 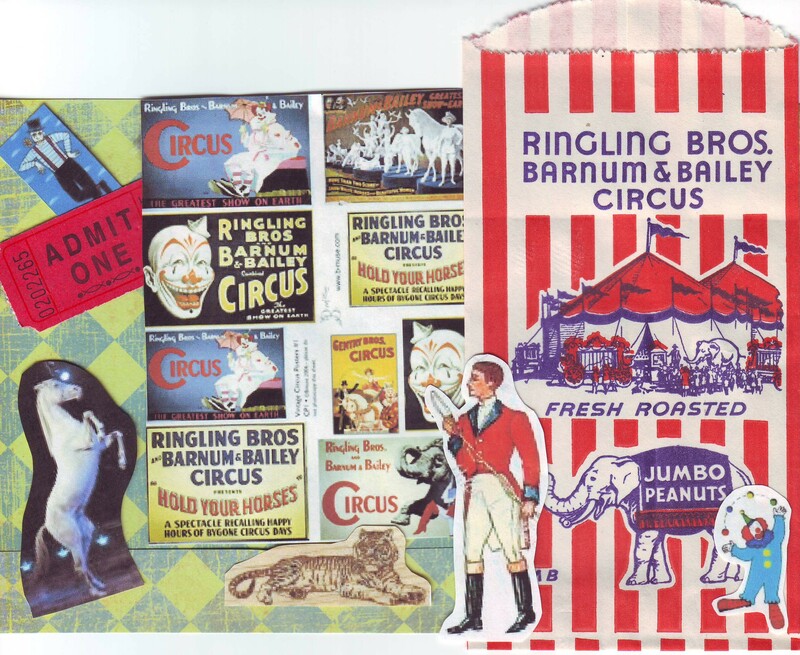 Ranging from the ringmaster, who thought himself ‘high class’ and ‘hot stuff,’ to the men setting up the tents and caring for the animals, to the performers who had the necessary skills of juggling, tight-rope walking, lion taming, etc. And the lowest on the social order—the ‘freaks’ or ‘strange’ folk that the others looked down on and avoided. There was no doubt the appearances of these circus folk could put one off… But what was underneath? Nothing worth investigating, according to the general circus population. But she had found much to admire: courage in the face of ridicule, honor even as they were treated dishonorably, and marvelous stories. What a wealth of stories she heard. It was only after being backed into a corner by the so-called ‘high class’ ringmaster that she realized it was time to leave. He threatened her against telling anyone and even that he would prevent her leaving. It was only after he was distracted by an accident with the flame-thrower that she could grab her satchel, change into a black circus-show panther and escape. As she slipped into the forest and wondered where to go, she thought back to the story told by Quinda, the bearded woman. “Many years ago, when I was a child traveling with my mother and the circus, I remember being asleep and waking up to see a beautiful lady in our tent talking to my mother. 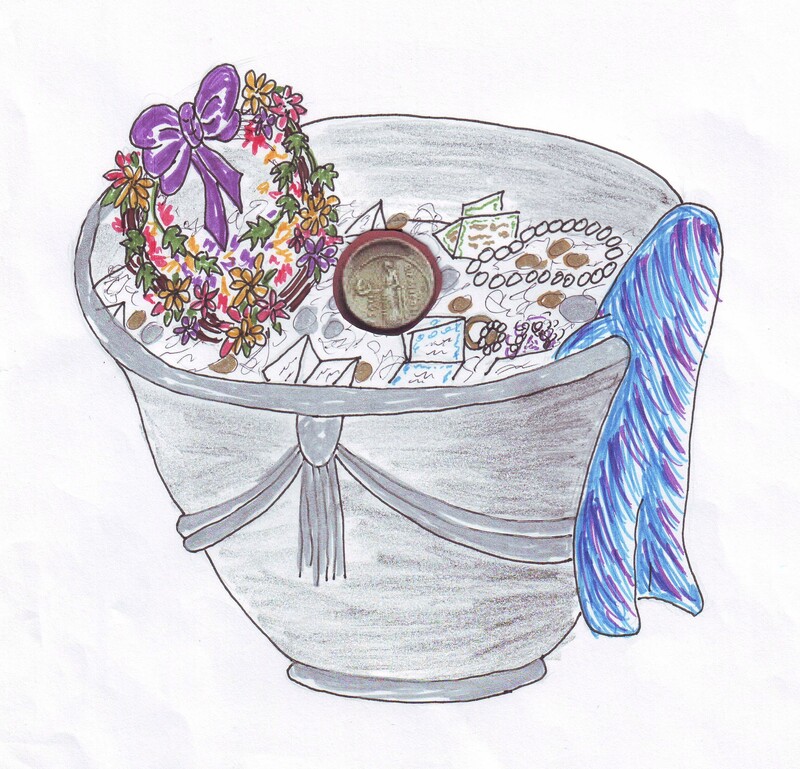 I moved close to lean into Mamam’s skirt, smelling the familiar lavender herbs she stored her clothes in. The Lady took my hand and looked directly into my eyes, not at my chin. She said she had seen me with my family and wanted me to know of possibilities other than being with the circus. I was young enough then that my beard was just starting to show. Mamam had always told me that one day I could be in the sideshow with her when my beard was full and thick like hers. I couldn’t wait to earn my own money! Now here was someone talking of how I could leave the circus and find the Lemurian City of Ladies where I wouldn’t have people staring at me and calling me ‘strange.’ I had heard folk say those things to my mother, but never, so far, to me. She thought of those words of Quinda’s as the she-as-panther streaked through the forest with her satchel bouncing along her side. After much traveling, she came to the crest of a cleared hill and could see into the distance. A beautiful city shimmered in the mist. Could that be the City of Ladies? She headed in that direction. When she finally came to a road, she changed into her normal body. What is normal? I guess most would consider me one of the ‘strange’ folk. She found a branched twig and sort-of combed her hair. She got our her alcohol-gel from her satchel and cleansed her hands. Feeling better, she stepped onto the road. She approached the city and caught up to a group of women, and after asking if anyone knew where le Enchanteur’s villa was. She was bombarded with an outburst of replies: “Oh, another one.” “Yeh, you can’t miss it.” Are you sure you really want to go there?” There’s talk of odd things happening in that place.” And each one quickly turned into one of the shops and disappeared before she could question them further. Slinking into an alley, she hid her satchel behind some broken pottery. Maybe she should see what was there first. Who were these people at the Villa? She shifted into a moth since dusk was approaching—no one noticed a moth—and flitted along looking for the Villa. There was the sign. She waited until another woman entered and flew in with her. Quickly finding a spot with good vantage view on a wall shelf in the foyer, she landed and looked around. She would stay like this until she knew more. No one notices a moth. Adjusting her satchel diagonally across her neck and shoulders, she found the wet coolness of the satchel’s outer material felt good. Somehow, this day seemed a lot hotter than when she set out. The plastic lining of the satchel and the plastic zip bags should have kept everything within dry. She scrambled up the embankment, as well as an overweight older woman could scramble, arriving at the top somewhat out of breath and with dirty sappy hands from grabbing at the shrubs for some balance. She arrived at the top, repositioned her clothing and satchel. Whew! Now, where am I? and where is that music coming from? She looked around and listened. A path ran along the stream bank with the music seeming to come from the right. OK, let’s go and see what we see. As she ambled along the pathway, she took note of the trees and wild flowers. Among the familiar flowers, some seemed to be those of the Ozarks, and some from her living in the Northeast. But some were entirely different. So very different! Wonder what they are? On the way back, if there is a way back, I’ll look closer. Follow the music. Reminds me of the circus figures I made for Essie for Christmas. I sure enjoyed researching, drawing then painting and cutting out the figures. Fun designing what to use and how to do it. Two layers of oaktag (now called poster board) glued together was the perfect thickness so the figures could stand up. Tried to get the same stuff Dad had used on my set years ago, but no longer available. It was so nice to hear that Essie enjoyed playing with them. She really enjoyed my putting her face on the horseback-rider’s body. I remember all the fun I had playing with my figures Dad had made for me. Now I was making circus figures for my granddaughter–the Wheel of Life. So many good memories for me and I hope, for her. The path moved away from the stream and now joined with another. Three children were ahead, probably coming along the other path, hopping and skipping along. The music was louder and now she could clearly hear the brass band playing marching music. Anticipation and memory quickened her blood. She remembered her first visit to a circus at Madison Square Gardens in New York City in the 1940’s. The overwhelming sights and activities in the arena upstairs—truly a three-ring circus—and the overwhelming sights and smells while visiting the animals in the basement of the Garden. The whole trip into the City with my family was exciting: going on the bridges over water and into the tunnels under water to enter Manhattan. So many new things to experience. And the wonderful circus music making your body move like a puppet on a string. She couldn’t help skipping and moving to the music she now heard. One of the boys stopped and turned around to look at her. She could hear him say in the honest/cruel manner children sometimes have: “She’s old. Why is she coming here? And why is she skipping? She looks silly. Let’s get out of here.” He grabbed the shirt of another child and they started to run away. Momentarily deflated, she hung back as they darted ahead. Now it was her weight and her age that occasioned some ridicule for being different. As a child it was being too skinny, dressed in mostly hand-me-downs from cousins, too shy and quiet. Later it was being too good and smart, then having children and staying home to be with them instead of working, then… then… then… always something. But now it doesn’t bother me the way it used to. I know my own worth and why I was like that and the struggle to overcome all the odds. I know who I am and where I am going. Well, I may know the essence of who I am under all the who’s I can be, but I may not know where I am going right at this moment. She came upon two objects nailed to a tree: one was a circus poster that caught her attention. Yes, that is who I need to be right now. A young girl who can skip and run and even… maybe… ride a beautiful horse, just like that. I always loved to ride horses, but I may be too large for one now. But a young girl would be perfect, like Essie.